A Cricket or Two. Or Thirty. You’d think the mice were enough. But somehow our kids came home from grandma and grandpa’s house with frogs. However, I distinctly remember saying they could bring two. I could’ve intervened, I know. 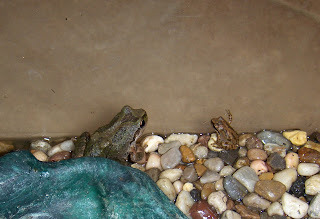 But when I saw how tiny the frogs were, I figured, two or six–what’s the difference? They’re actually pretty cute. Besides, it’s not the frogs that are the problem. Not exactly the sweet cup of coffee he brings upstairs most mornings. It took me a second to understand what he was saying. See, we’d bought this thing for the frogs called the Bug Box. 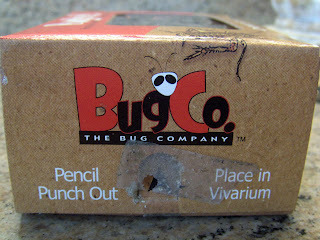 It’s a whole little cricket ecosystem, all in one box. Tasty, plump morsels that stay fresh, too. And when it’s time to feed the frogs, you just open the little trap door on the side of the box, shake a cricket out, then close the door. Or at least that’s what I did. I even taped over it for good measure. And after they escaped through the hole, they proceeded to gallivant around our kitchen. And our living room. And our dining room. The picture doesn’t do the scene justice. This just happens to be the only cricket that would stop hopping long enough for me to get a shot. 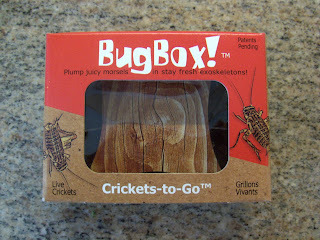 I don’t know how many crickets come inside those Bug Boxes, but let me just say there was a great turnout at the cricket party at our house that morning. The nice, little 6 a.m. cricket party. There I was, on my hands and knees (without coffee, I might add), chasing crickets around with a paper towel and tossing them into the frog cage. Except for the crickets that were a little too fast or a little too big. Those I might’ve pinched a little too hard. At least the frogs were happy, though. Until I had my coffee. Mostly. 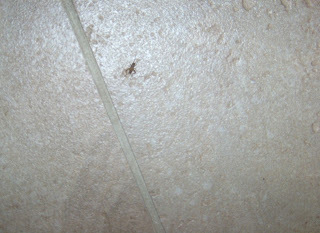 Because, still, all that day and the next, we found crickets around the house. Running along the baseboards, lurking in the corners, hopping across the carpet. And, call me weird, but that gave me the willies more than finding my daughter’s mouse in the laundry basket. Enjoy your weekend, everyone! Do you have any fun plans? 2 Comments on A Cricket or Two. Or Thirty. Enjoyed reading this,we have crickets here too,but not bad. frogs in a cage ahahaha I can’t see me even touching them but you where very brave !